Welcome to La Tapa. Our focus is to make you feel as if you are dining in our home providing warm and professional service along with tasty and comforting food. Let us include you in the beauty and charm of St. John. Elegant eclectic with warm rustic ambiance. Sidewalk seating, outdoors. Cozy indoor seating with eight large arched, shuttered doors and windows. Covered porch seatings. 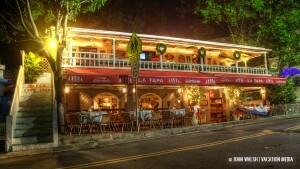 Located in an old West Indian building in the heart of Cruz Bay ~ Seats 68. Our menu changes nightly.